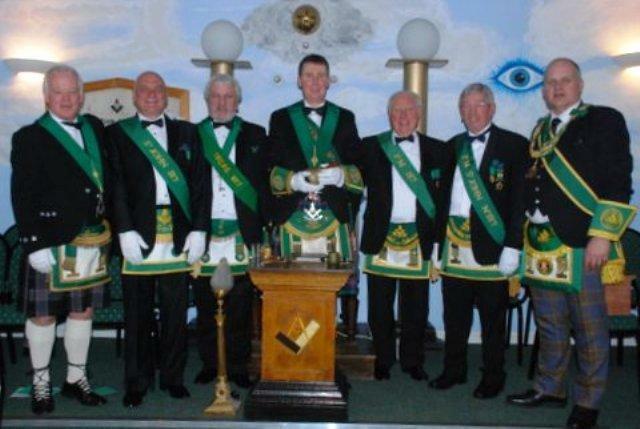 Lodge St. John No. 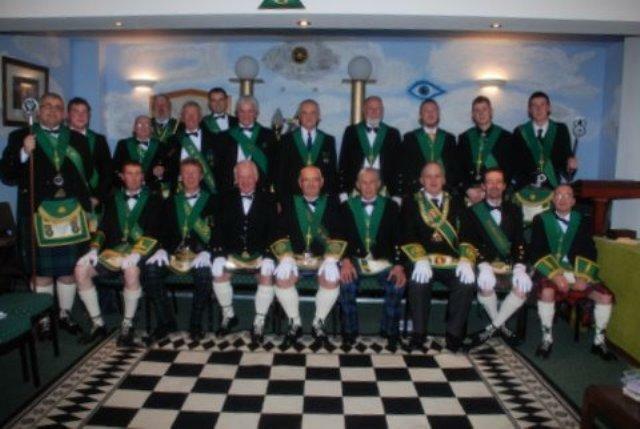 187, Carluke. 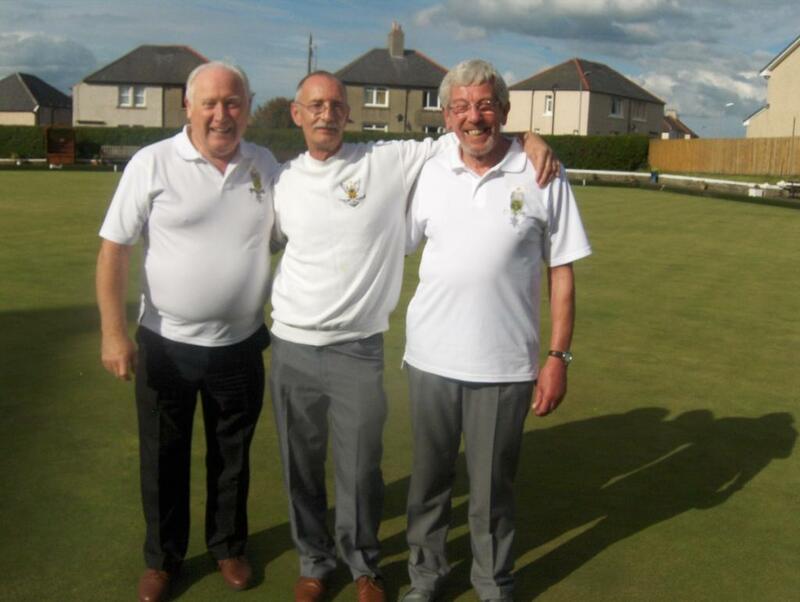 Lead: John Smith, Second: Robert Paterson and Skip: Billy Copland. 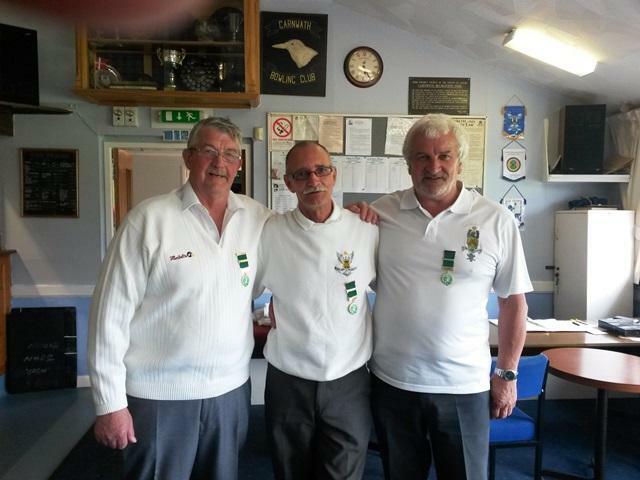 Runners up were Tom Law, David Wood and Tom Cross. 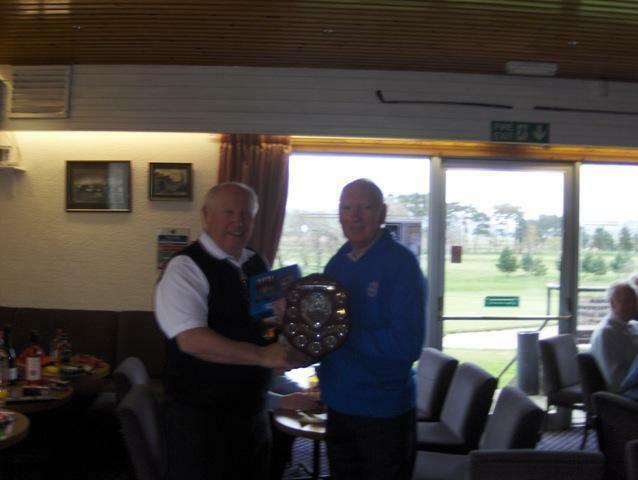 The trophy and prizes, were presented by Philip Smith R.W.M. James Bridges P.M. sponsored the day. 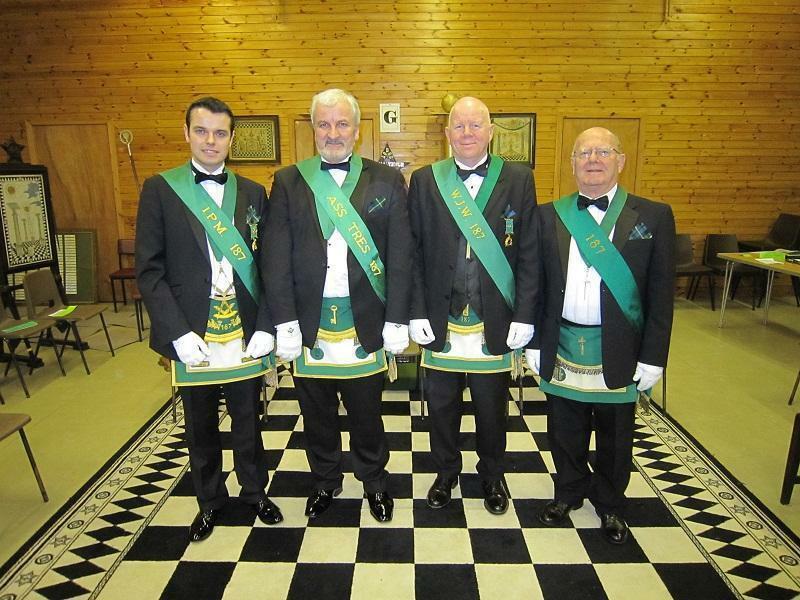 Annual visit to Lodge Kilmolymock No. 45, Elgin - January 2017. 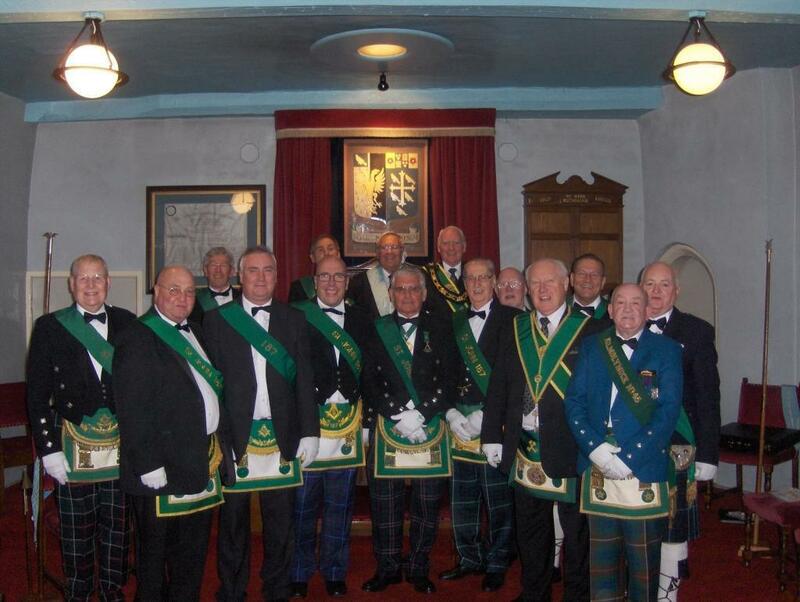 Some of the Carluke brethren with the newly installed R.W.M. 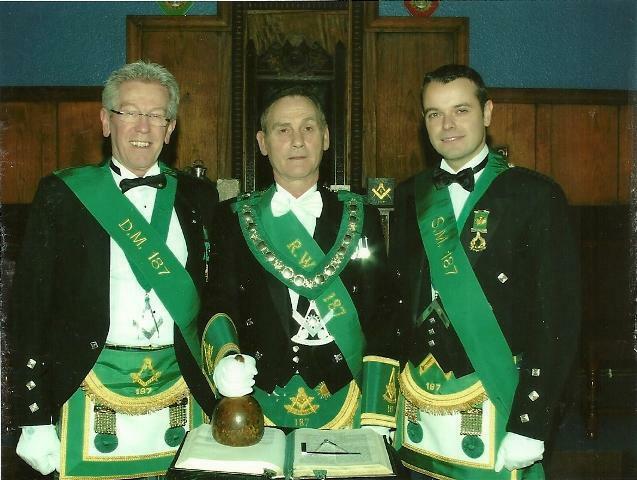 Kenny Forbes P.M. - 187, and David Bernard P.M. 1184. Members can view additional pictures by clicking here. 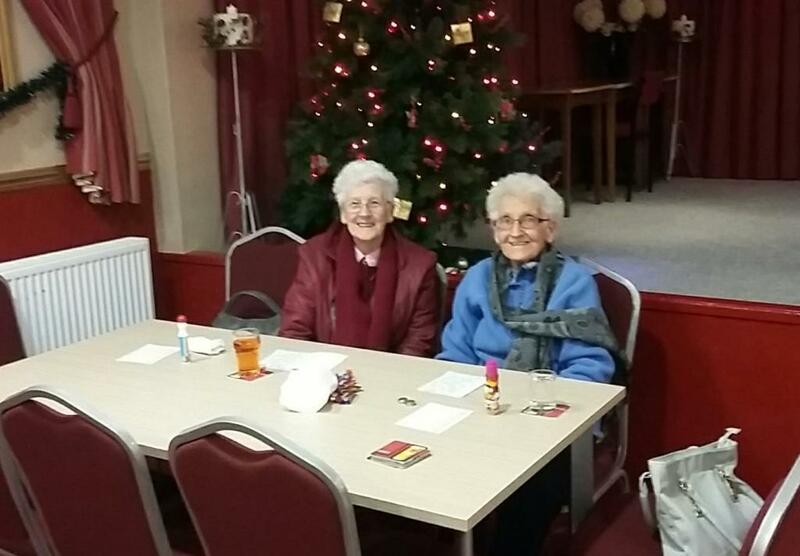 Christmas Bingo Session 2016 - Waiting for the "eyes down". Ready to hit the road - Annual visit to North Wales - September 2016. 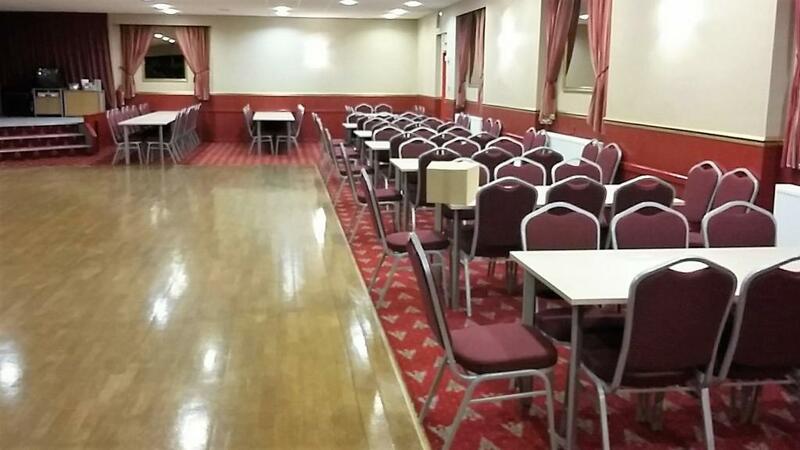 Function Hall refurbishment - August/September 2016. 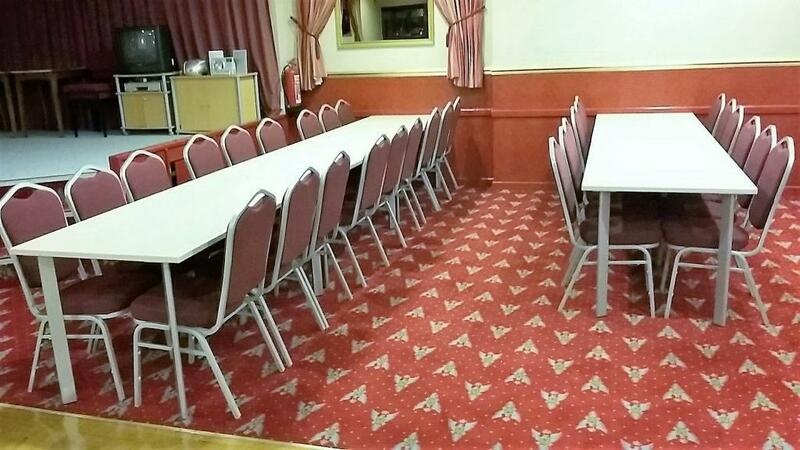 Decorating complete, carpet cleaned and new tables and chairs in place. Job well done!! 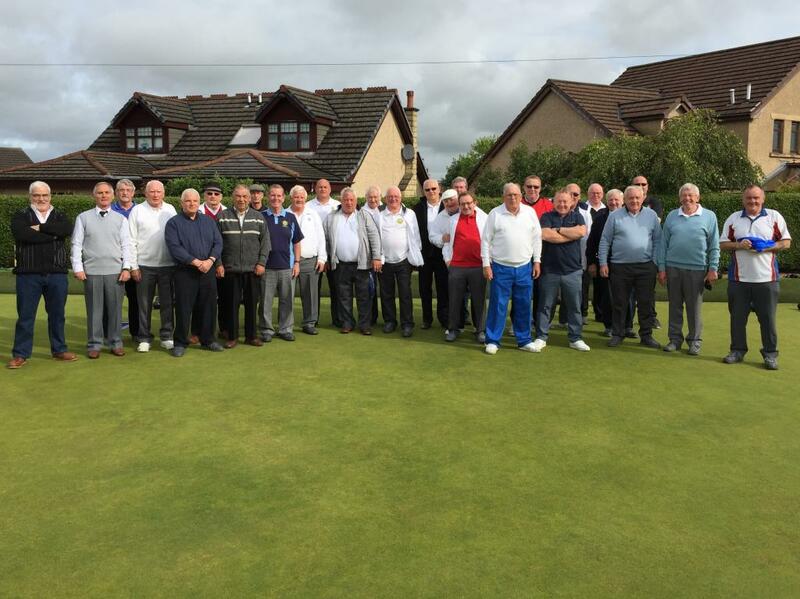 Lord Lamington Bowling Competition - August 2016. 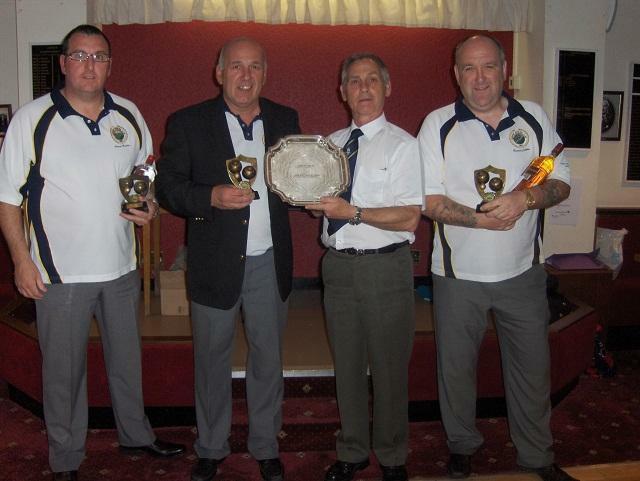 Unfortunately TEAM A could not emulate the success of the Lodge team winning this event in 2015. It was regretable that TEAM B could not participate, since a team member pulled out at the last minute, hence the sad picture below. 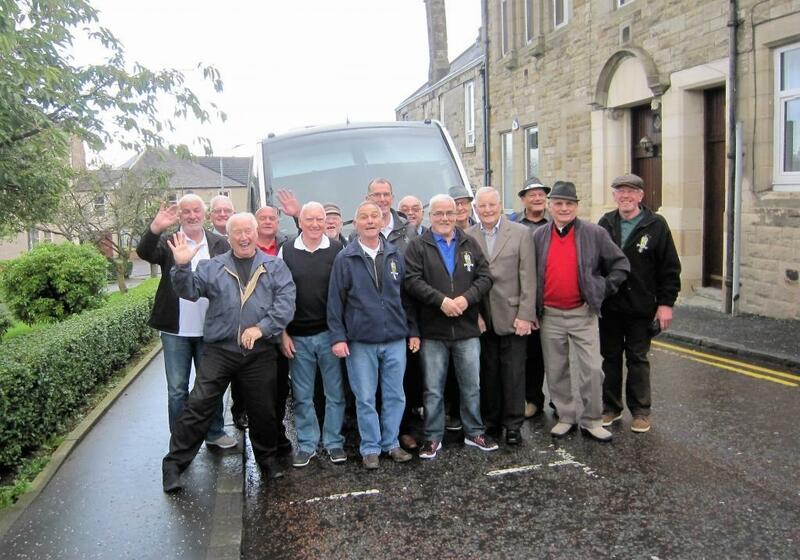 Carluke members travelled to Rhyl on 14th May 2016 to join the 25th Anniversary celebrations since Consecration of Old Ruthinian Lodge No. 9399 in the province of North Wales. 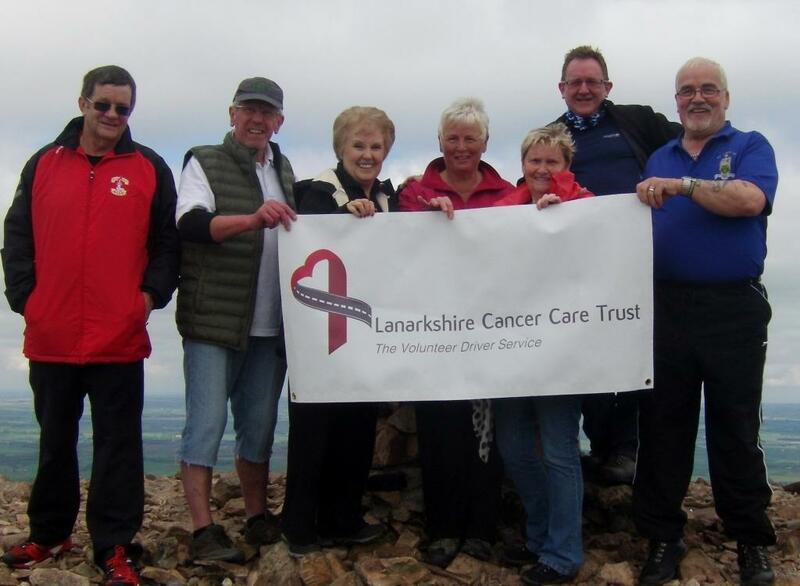 Lodge members and friends celebrate reaching the top of Tinto. 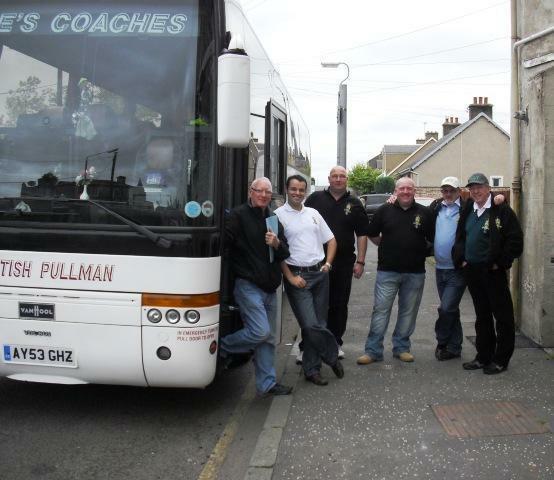 Proceeds will be donated to Lanarkshire Cancer Care Trust. 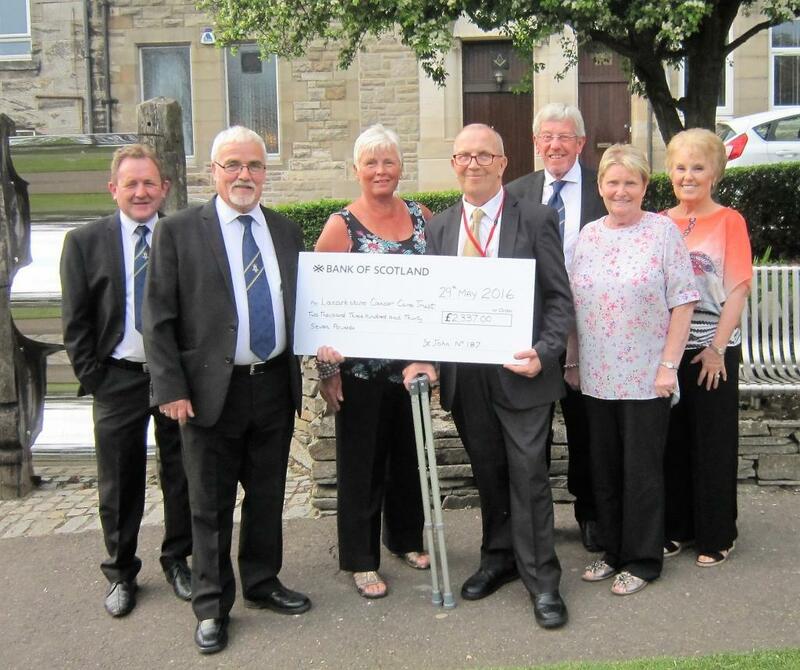 Cheque presentation, for the sum of £2,337, being made to Mr George McGregor, from Lanarkshire Cancer Care Trust, outside the Temple. Visit by Bro. 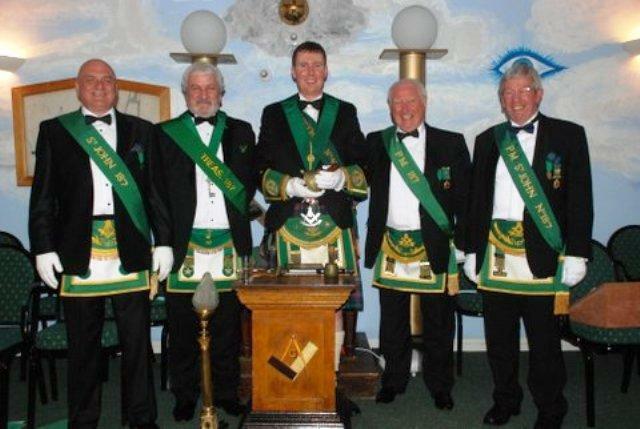 Ian Grieve P.M. and Bro. 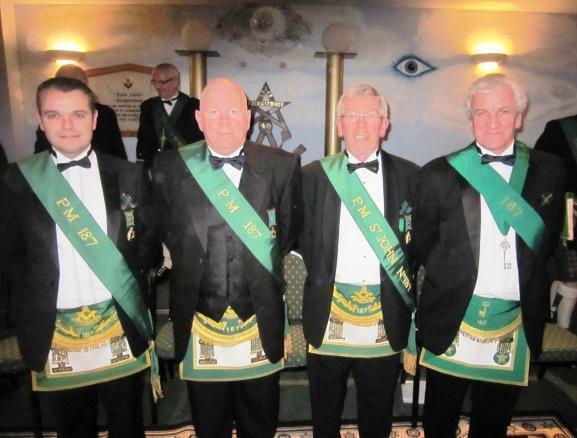 Tom Reid, Treasurer to Lodge of Sincerity No. 428, Northwich - May 2016. 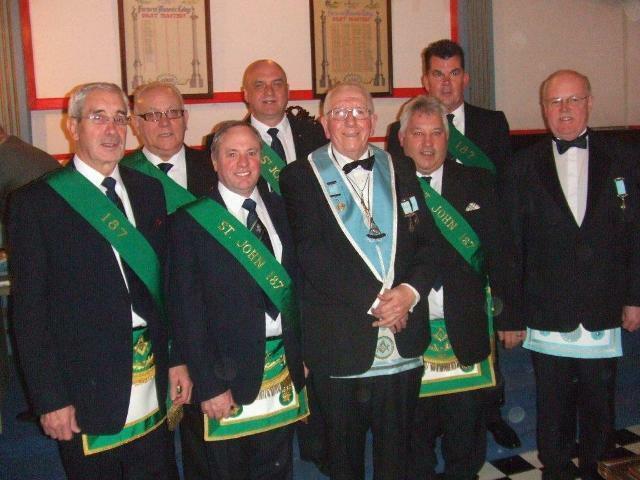 A special meeting was held on Wednesday 4th May 2016 to celebrate 50 years in Masonary by Bro. Walton Bowyer PPr.SGW. 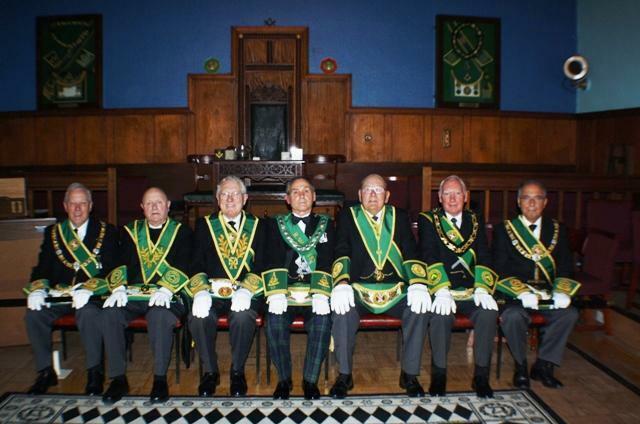 - seated in the centre of the above picture. 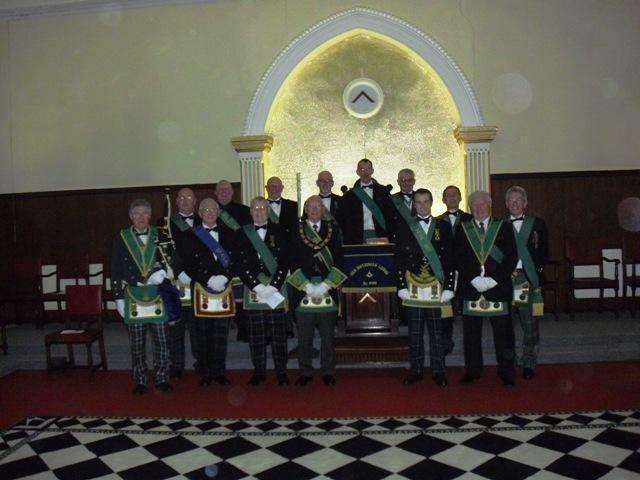 Twelve Lodge members who made the trip to Elgin with Bro. 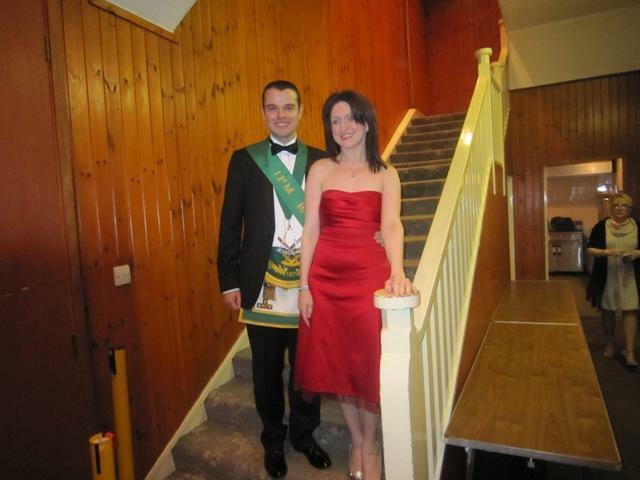 Christopher Andrew MacPherson, the newly installed Right Worshipful Master. 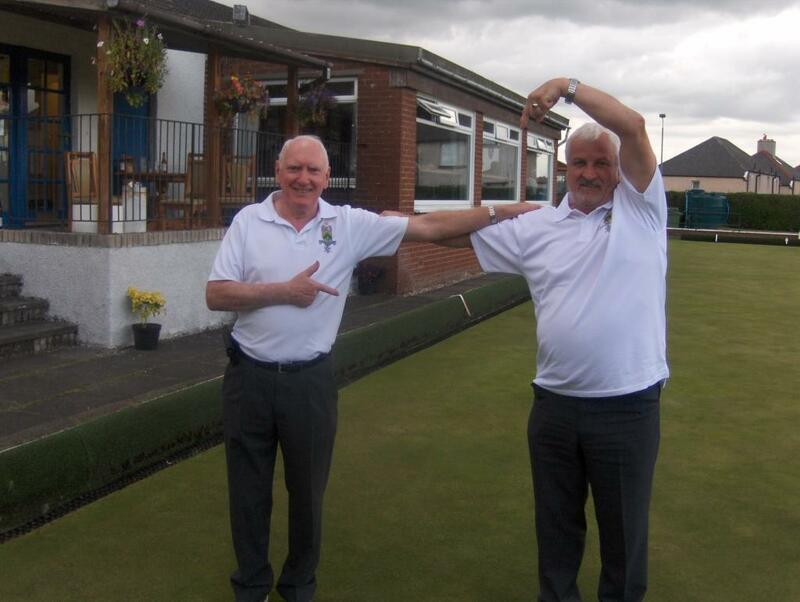 Winners of the Lord Lamington Bowling Competition - 2015. 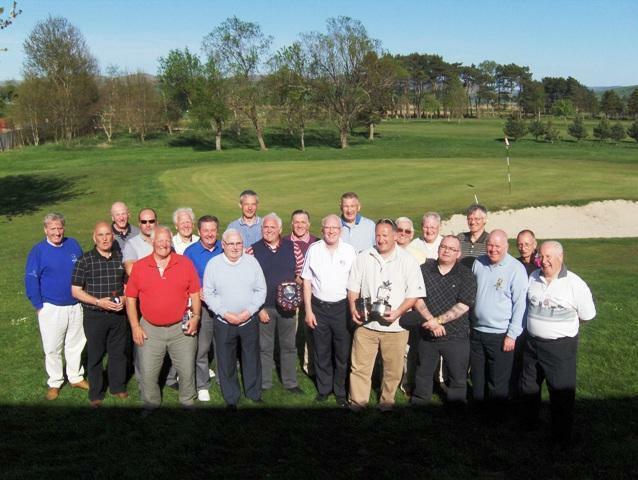 The proud 187 winners of this years trophy, hosted by Carnwath Bowling Club. From left to right Bro. 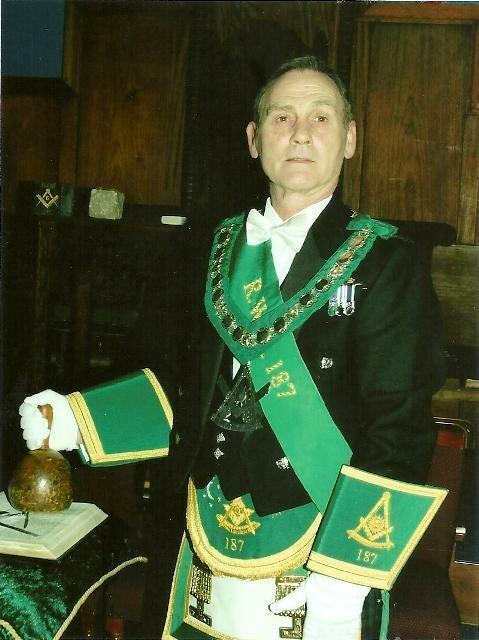 Robin Jardine - Almoner, Bro. Sammy Blair - P.M. and Bro. Tom Reid - Treasurer. 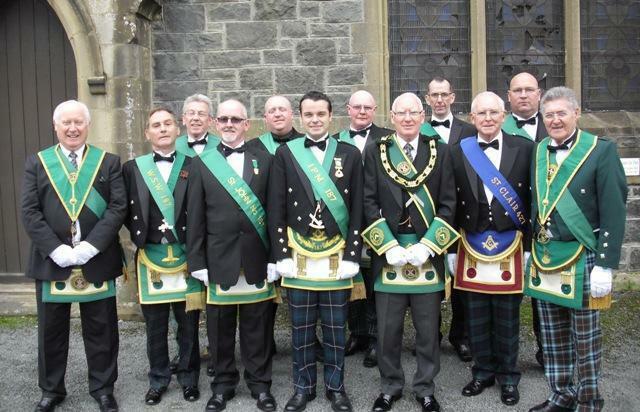 Annual visit to Lodge Kilmolymock No. 45, Elgin - January 2015. 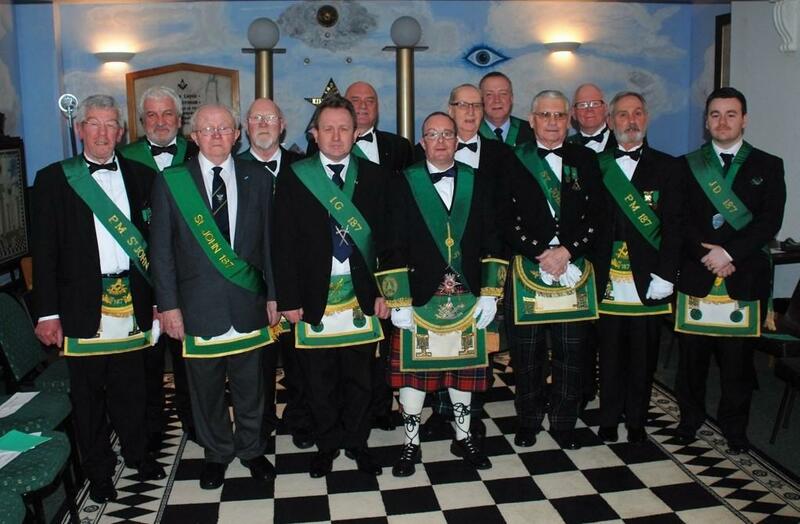 Eleven Lodge members who made the trip to Elgin, with Bro. 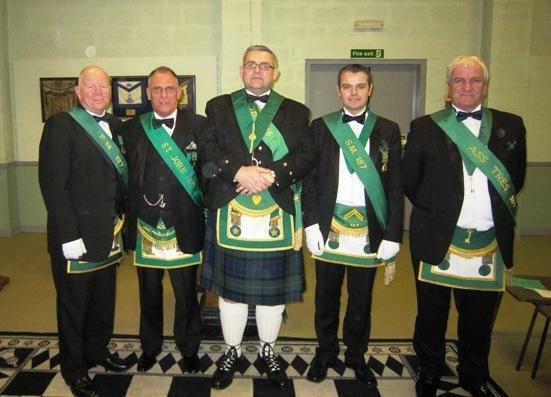 Alistair Samuel Riddell, newly installed Right Worshipful Master. 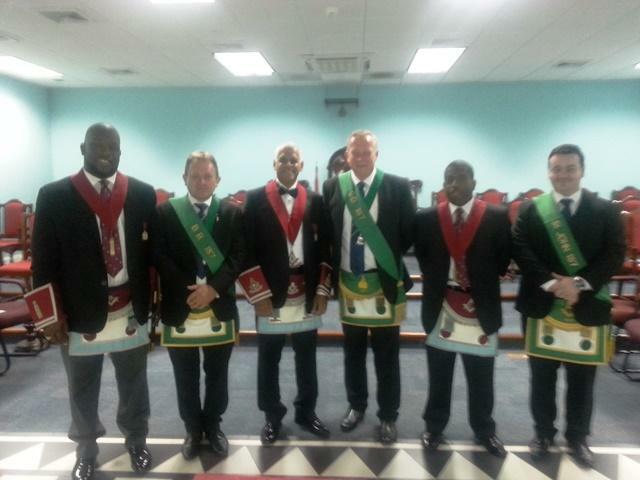 The installation ceremony was performed by four past masters from Lodge 187, namely Bro. Ian Grieve, Bro. Robert Donnelly, Bro. Kenneth Forbes and Bro. Gerry French. Addition pictures by be viewed by clicking here. 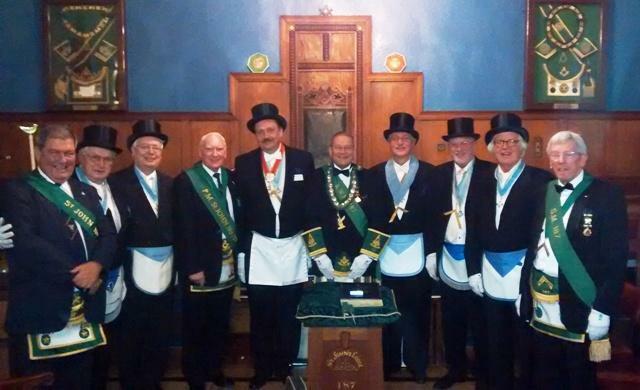 Six visitors from Hannover with 187 brethren in the Temple. 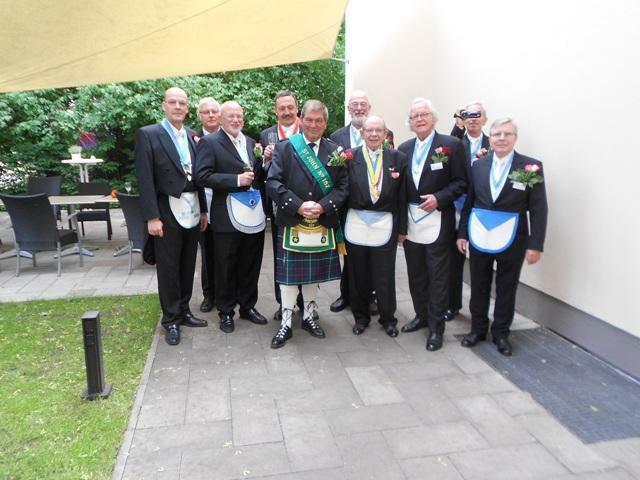 Horst Jonigkeit, member of the Bundesdirektorium of Große National-Mutterloge ‘Zu den drei Weltkugeln’, VII°;Helmut Brandes, Wachthabender& MM,VII°; Helmut Bechem, past Senior Warden&MM, VII°;Dietrich Kokemüller, MM&dep.RWM, VII°; (Dr.) Hans-Joachim Fricke, MM, III°, Bernd Menke, MM&RWM, V° ) all in Johannisloge ‘Wilhelm zur deutschen Treue’ R.Y. Hannover. Easter Coffee Morning - April 2014. 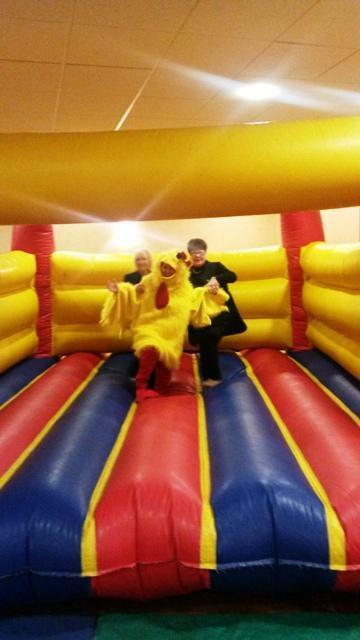 In-house Health & Safety Executives testing the bouncy castle to ensure that it fully complies with current regulations. Annual visit to Kilmolymock No. 45, Elgin - January 2014. Bro. Tom Thompson, 187. - Bro. Tom Reid,187. 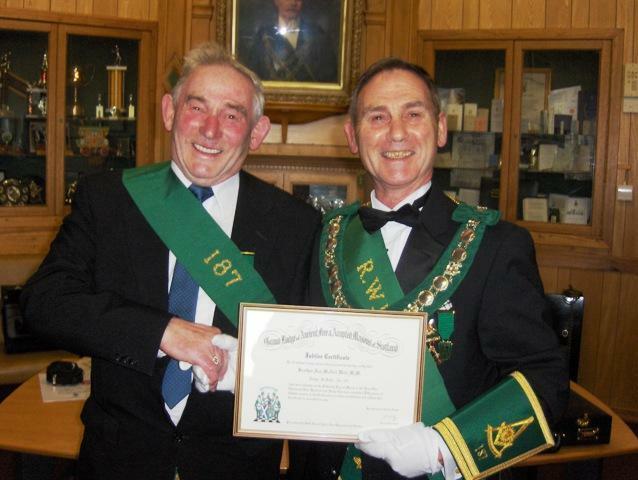 The newly installed R.W.M. Bro. Alistair S. Riddell. Bro. James Bridges, P.M.187. - Bro. Ian Grieve, P.M.187. Bro. David Robertson, P.M. 45. - Bro.Tom Thompson, 187. - Bro.Tom Reid,187. Bro. James Bridges, P.M. 187. - Bro. Ian Grieve P.M.187. Bro. Allan Lawrence, P.G.M. of Moray & Nairn. 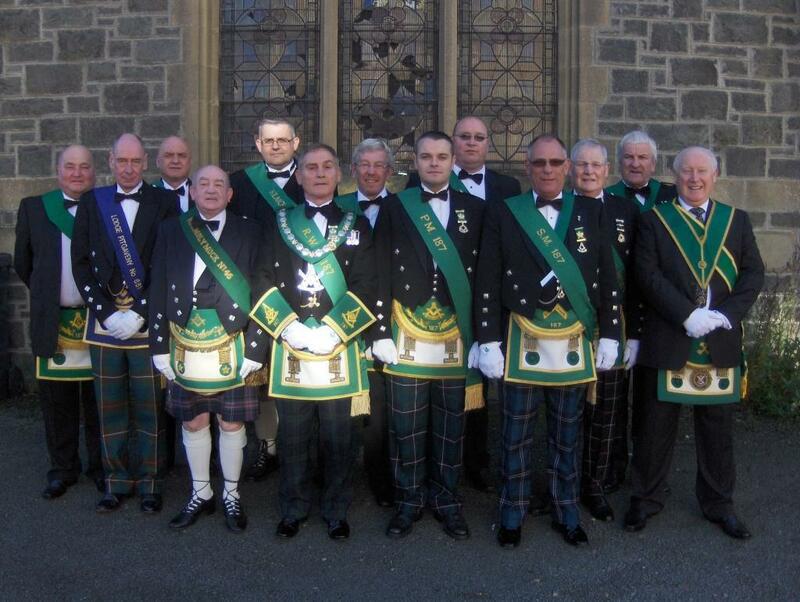 Annual Installation - December 2013. L - R - R.W.I.M. Robert S. M. Donnelly, P.M. - R.W.M. James D.Atkinson R.W.I.M. 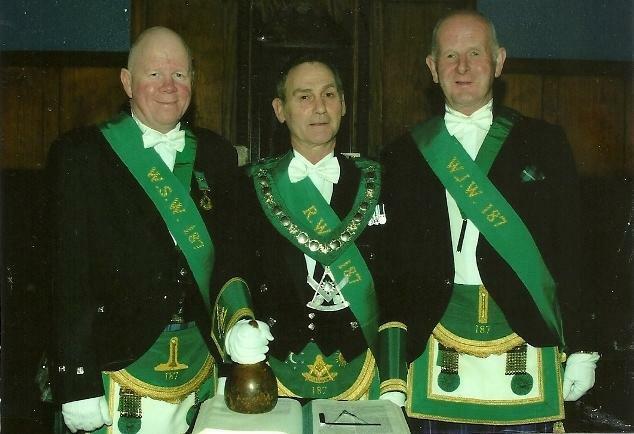 Alexander P. Brown, P.M. - R.W.I.M Ian J. W. Grieve, P.M. Formal pictures can be viewed by clicking here. Pictures taken during The Festival of St. John can be viewed within the members zone by clicking here. 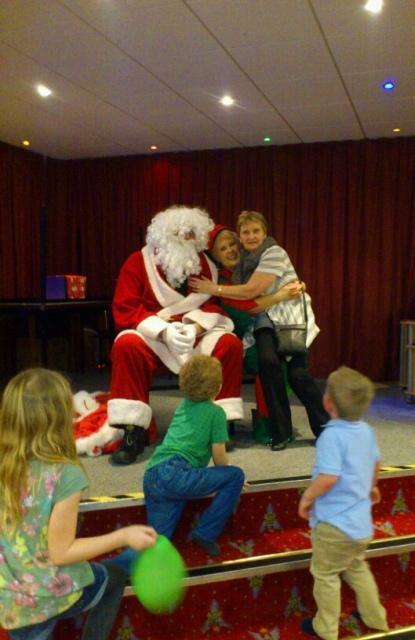 Christmas Coffee Morning - December2013. Who said Christmas was only a "kids" thing??? Annual visit to Old Ruthinian, North Wales - October 2013. Additional pictures are available in the members picture zone. 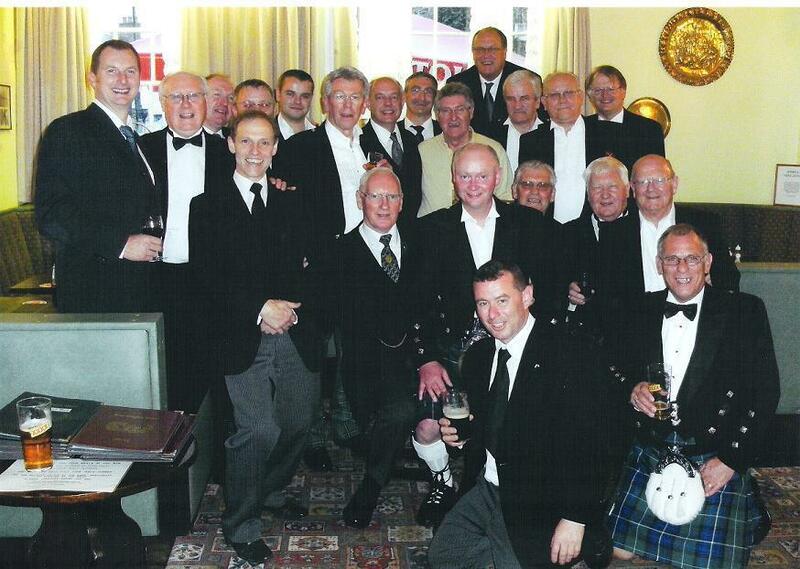 May 2013 - Eddie Wright visit to Germany. The first two pictures were taken outside Lodge Wittekind in Minden when Eddie attended a Johannesfest (St. John's Day). 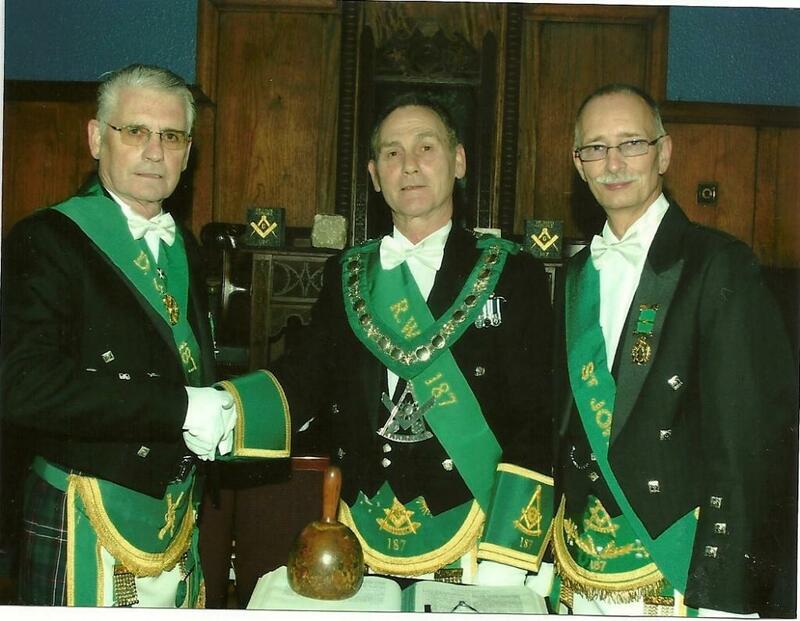 The other three are taken at an Installation and Johannesfest at Lodge Zur Deutchen Treue in Hanover. 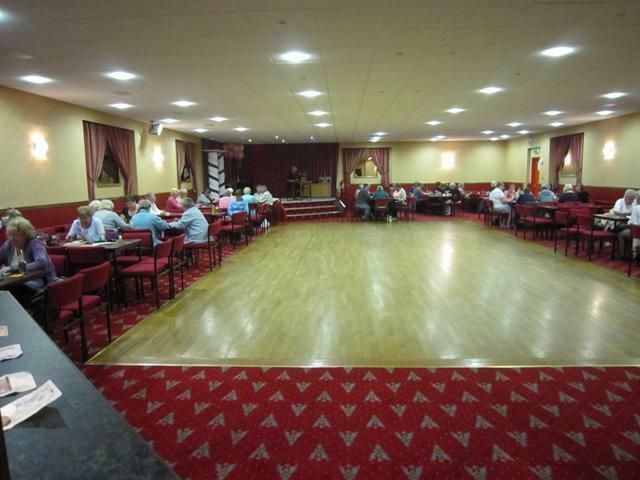 Lodge Annual Bowling Day - August 2013. 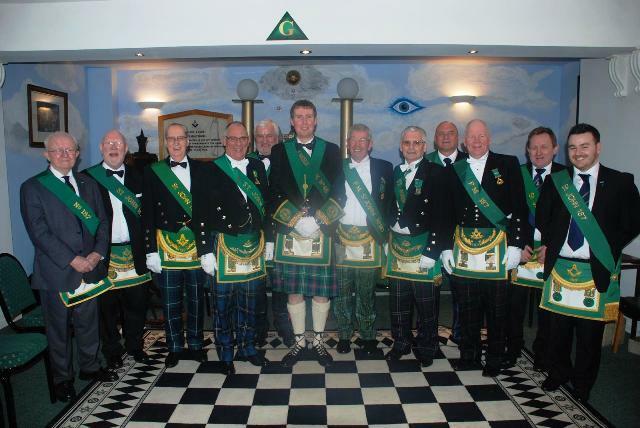 Annual Installation - 22nd December 2012. 15th December 2012 - St. Servanus No. 771, Alva - Installation. R.W.I.M. Bro. Russell Mc Kendrick P.M., R.W.M. Bro. 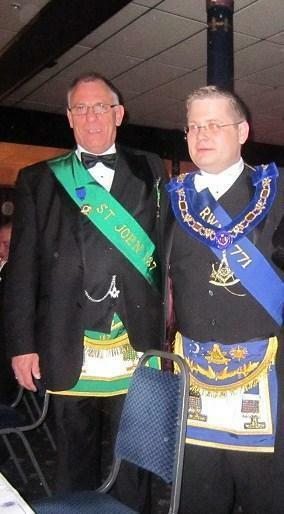 Ian Stanners and R.W.I.M. Bro. Ian Grieve P.M. - Lodge St. John No. 187. Additional pictures can be viewed in the members zone by clicking here. Additional pictures can be viewed in the members zone. 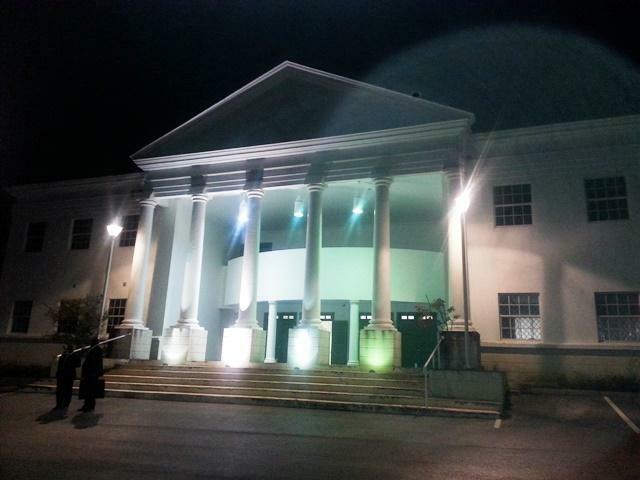 Rededication Ceremony of Newlands Masonic Temple. 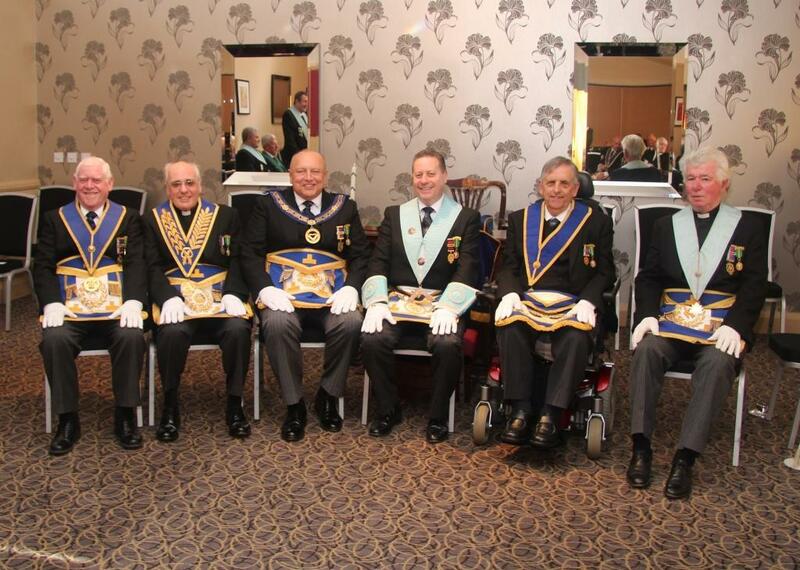 Grand Lodge and Provincial Grand Lodge of Lanarkshire Upper Ward attendees. 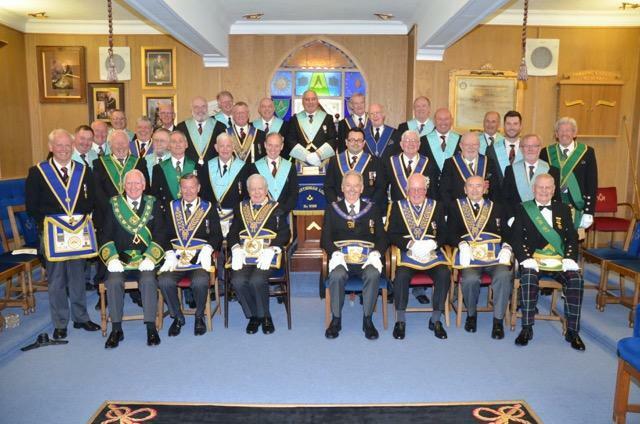 Grand Lodge and Provincial Grand Lodge of Lanarkshire Upper Ward and Lodge St. John No. 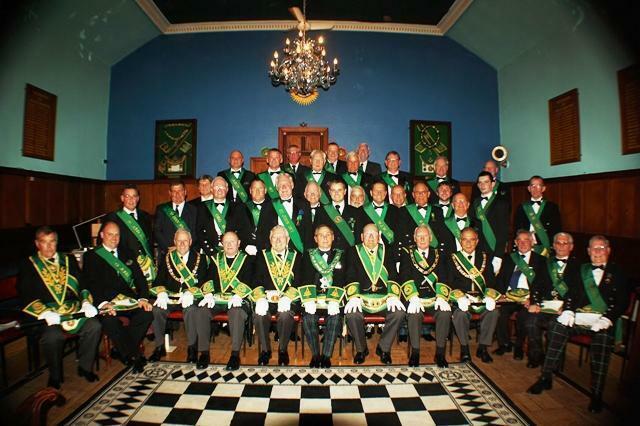 187 office bearers present on the day. 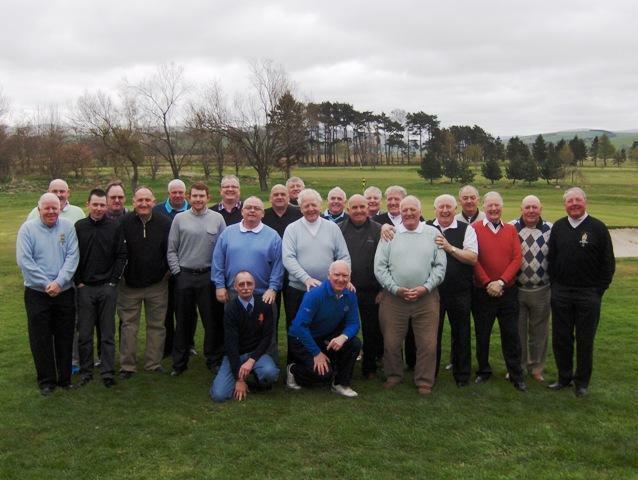 SUNDAY 29th APRIL 2012 - BIGGAR GOLF CLUB. 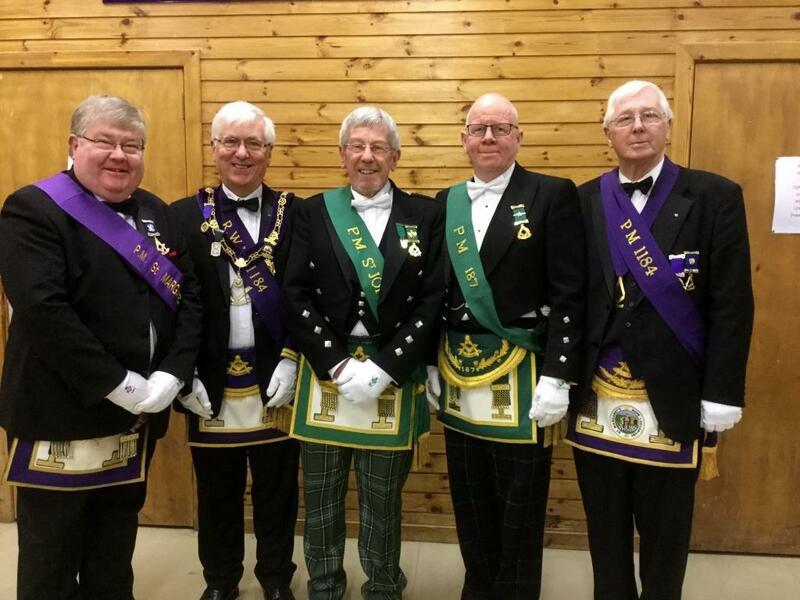 Annual Visit to Lodge Kilmolymock No. 45, Elgin - January 2012. 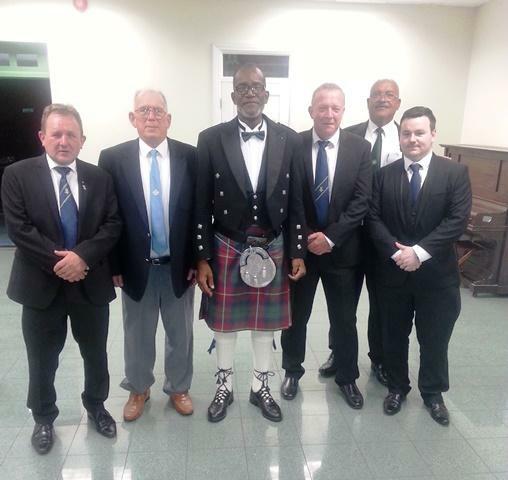 Four brethren, Bros Fraser Lyle PM, Kenny Forbes PM, Ian Grieve PM and Tom Reid attended the installation ceremony of Bro. Alistair John McCook on 14th January 2012. 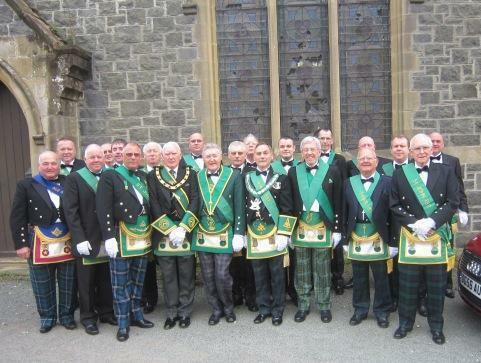 Carluke brethren were honoured to be invited to be part of the "official" Kilmolymock picture. 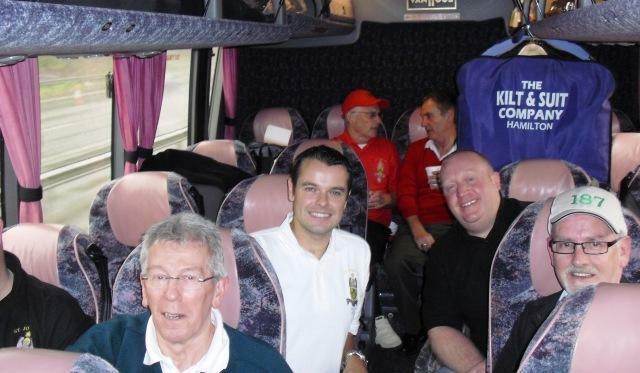 Members can view more pictures of the weekend by clicking here. 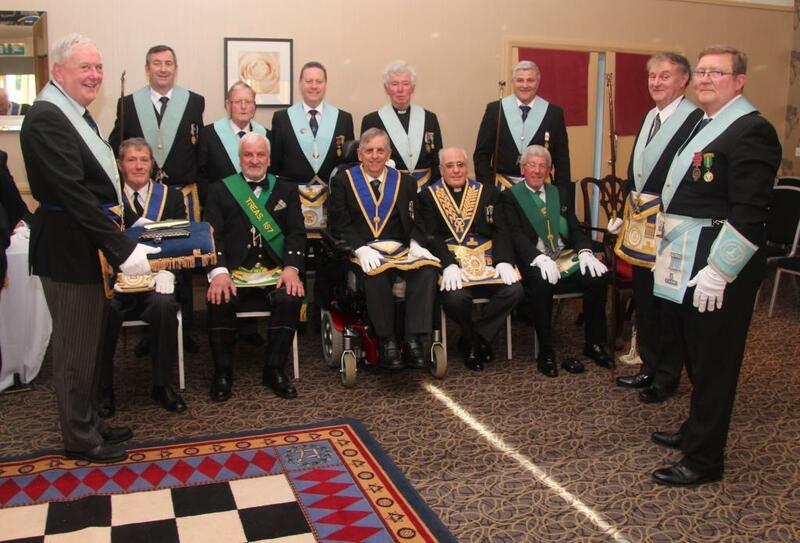 Visit to Lodge Farmers No. 1000, Newton Ards, Co. Down, N. Ireland - January 2012. 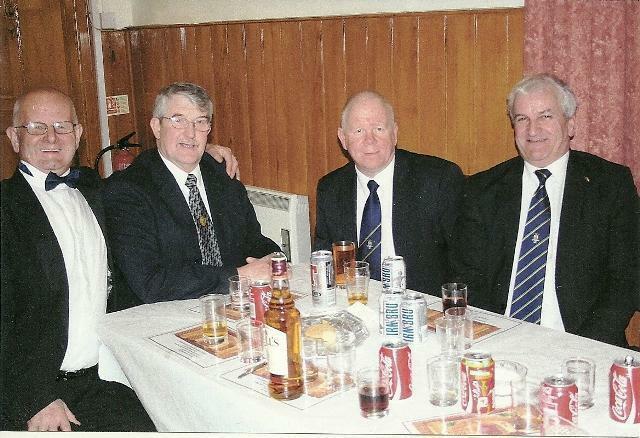 Six brethren Bros John Callan. 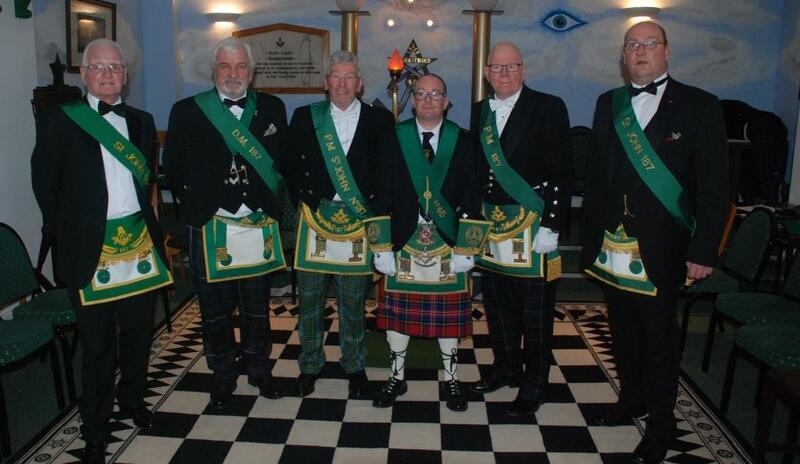 David Callan, Robin Clark, Tom Thomson, George Laird and Don Black attended the installation ceremony of Bro. 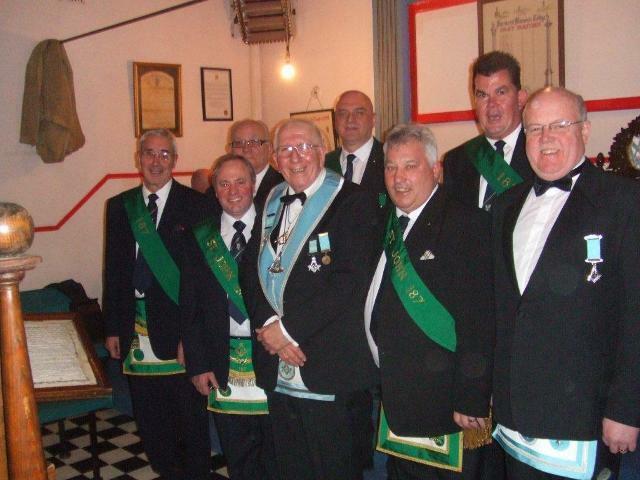 Alfie McKee on 13th January 2012, in their bicentenary year. 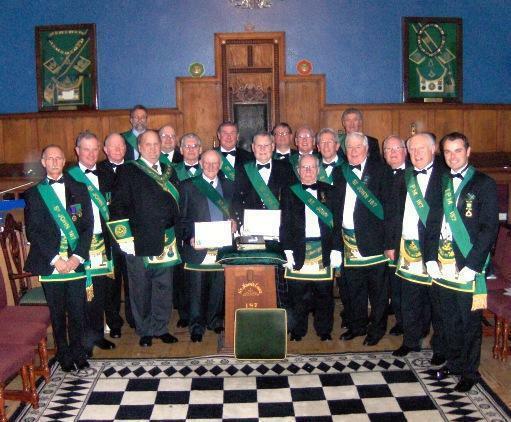 Annual installation of Lodge Office Bearers, December 2011. Members can view pictures taken on the day by clicking here. Additional pictures can be found within the "members" site by clicking here. Bro. 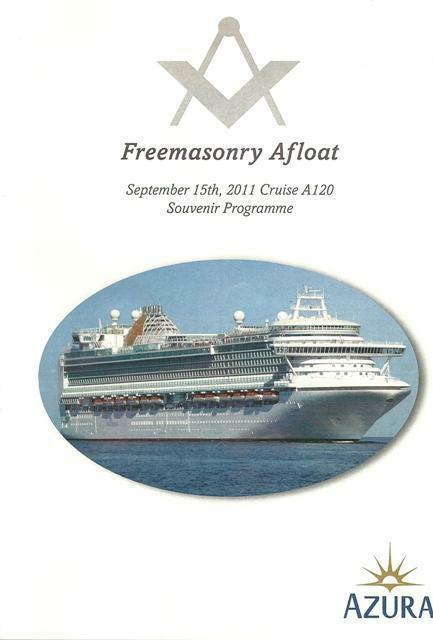 Donald Lamb attended a Masonic Charity Cocktail Party on the Azura hosted by Captain Keith Dowds. 187 members will also be able to pick out Bro. Graham Gilchrist R.W.S.P.G.M. 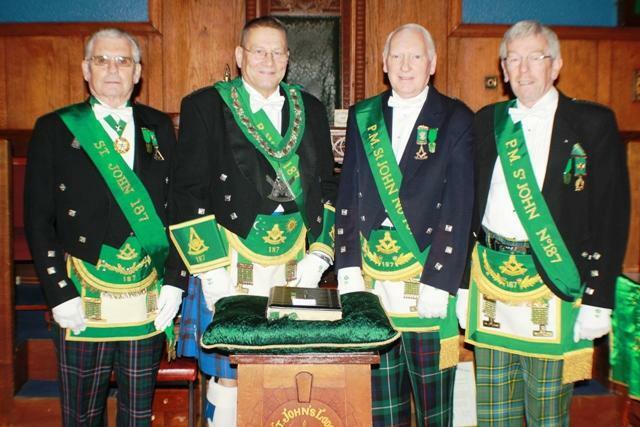 of Moray & Nairn and Almoner of Lodge Kilmolymock No. 45 Elgin. Annual Bowling Tournament - August 2011. 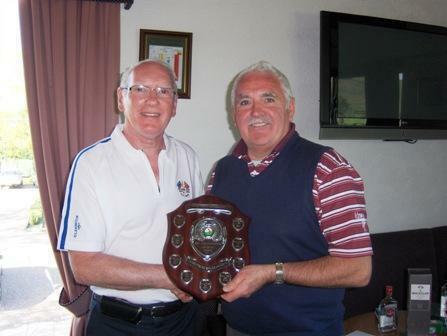 The ‘John McLean’ Trophy, was won by Robert Boyd, Skip, Ronnie Callan, Second and James Martin, Lead. 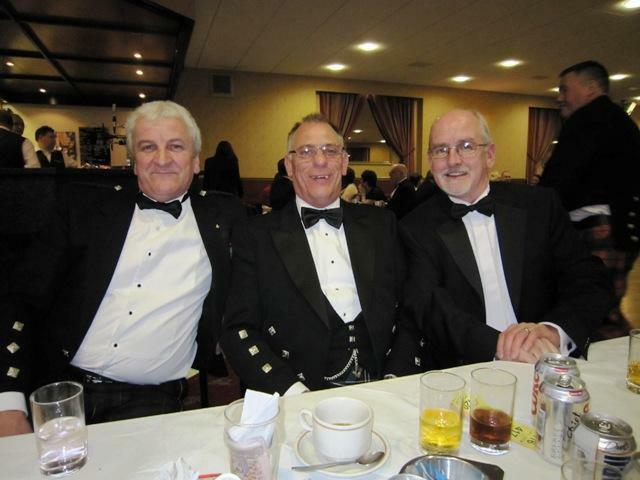 A Charity Fund Raiser Party Night in Aid of Ward B7 within the Beatson Hospital West of Scotland Cancer Centre, was held on Friday 3rd June 2011, within the Lodge Function Hall. 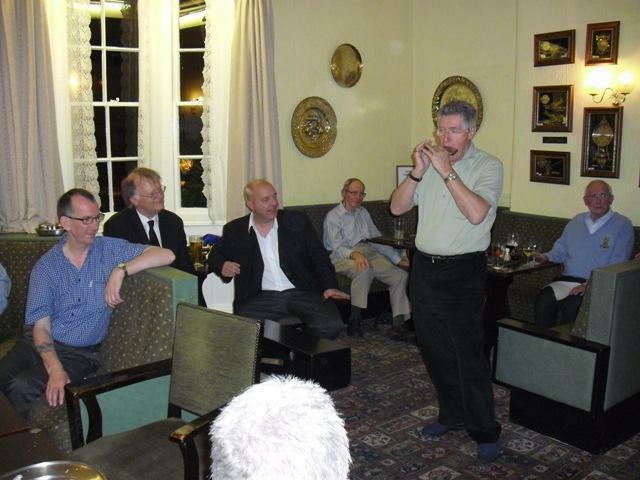 This very successful evening was organised by Bobby Cleland I.P.M. who has been receiving treatment throughout the past year in Ward B7. The sum raised, to date, is £2,900. Bro. 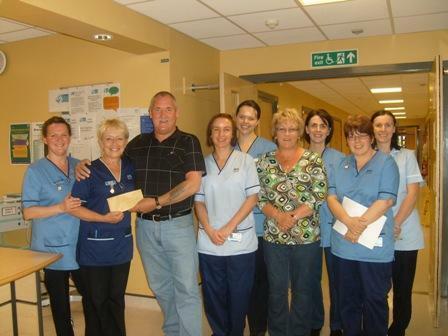 Robert Cleland presenting a cheque to the ward sister. Bro. 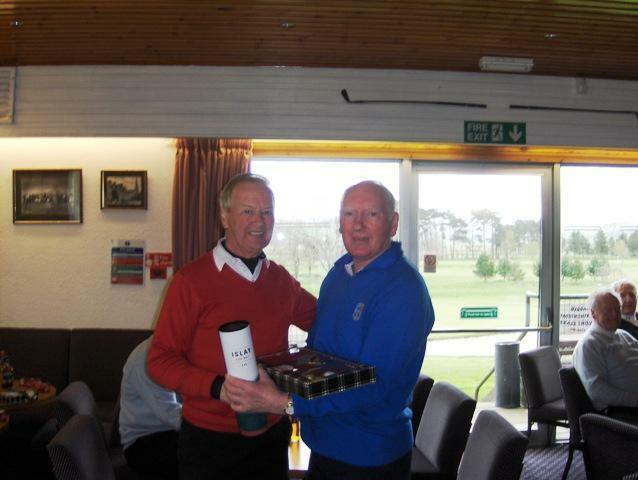 Ronnie Christie won the Stableford Competition Shield and a bottle of Maccallan. Bro. 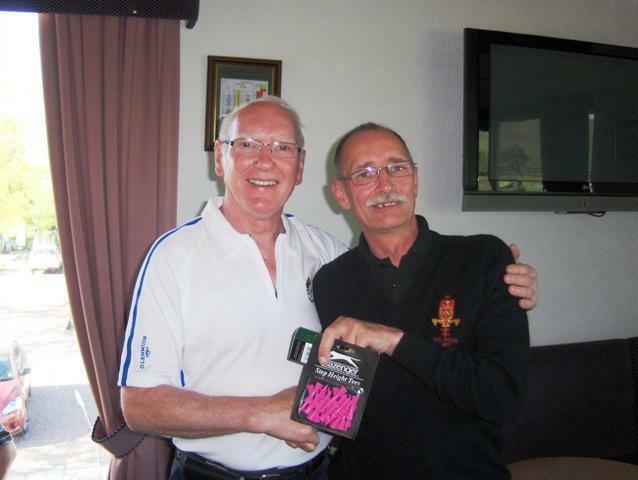 Sammy Blair P.M. won the booby prize, three golf balls and a pack of tees. 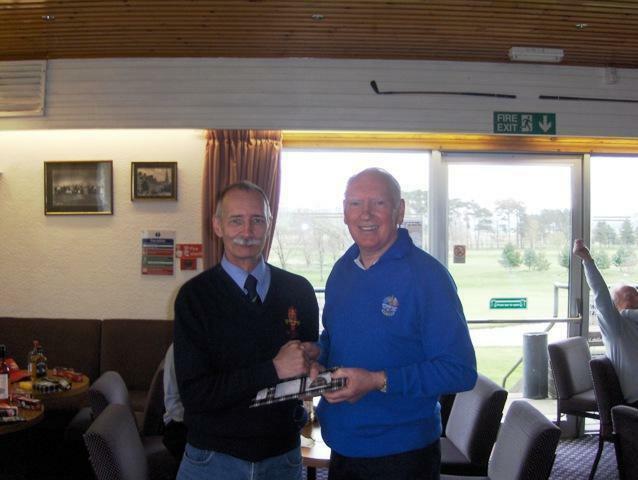 Prizes were presented, on the day, by Alex Brown, Substitute Provincial Grand Master. The March being assembled to be led by the R.W.M. Pictures, taken throughout the evening, are now available within the Members Picture Zone. Additional pictures can be found within the members picture zone. Bro. 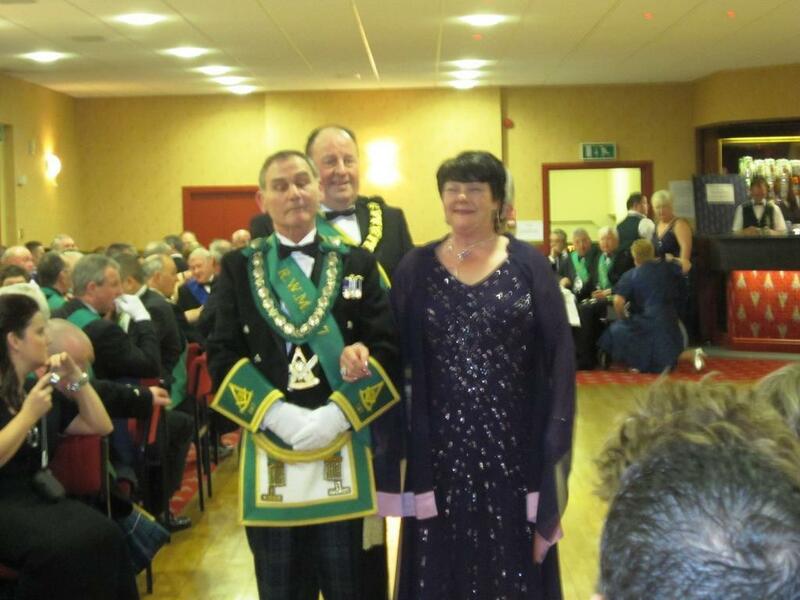 Ian J. W. Grieve P.M. Bro. Fraser J.D. Lyle P.M.
Bro. 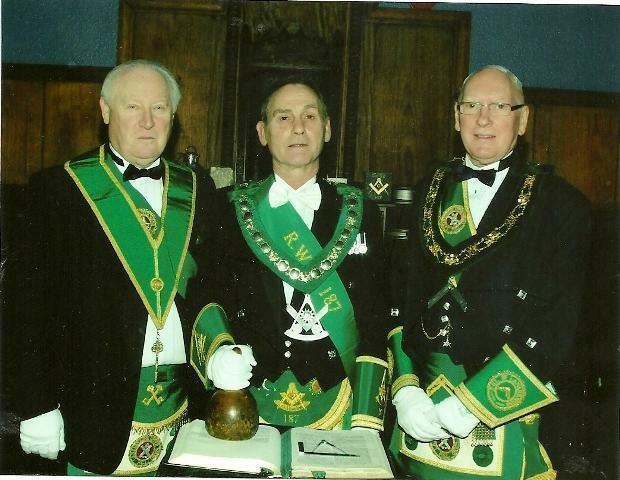 Robert S. M. Donnelly P.M. Bro. Samuel Blair P.M.
Bro. 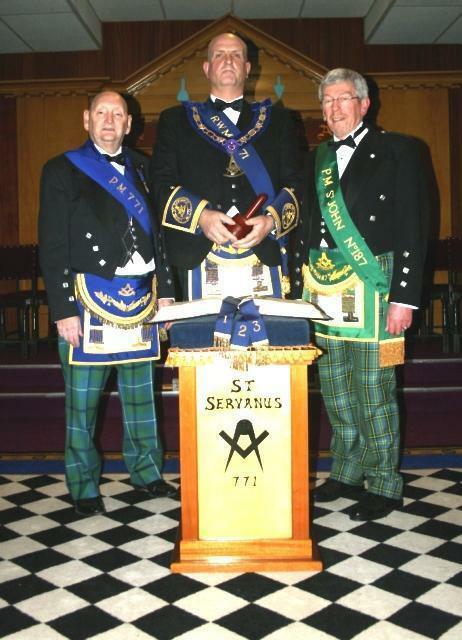 Kenneth R. Forbes P.M. Bro. Raymond Gallagher. Bro. 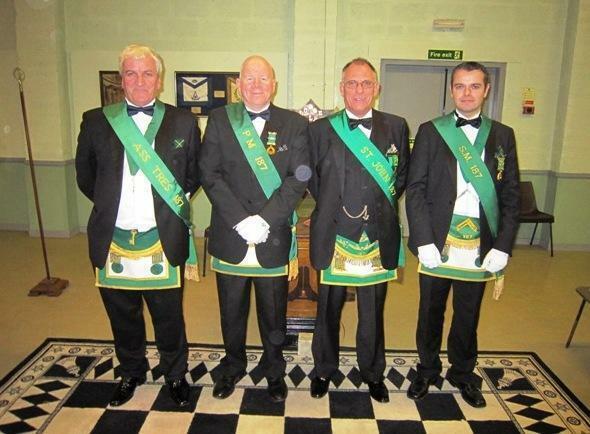 James B. C. Bridges P.M Bro. 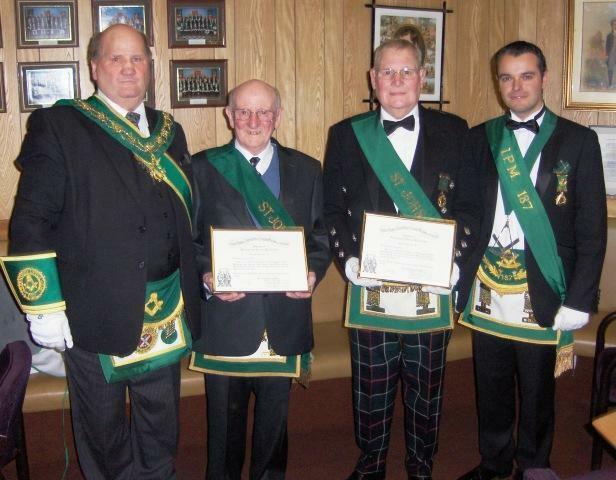 Alexander P. Brown P.M.
Past Masters George H. Campbell and James F. Brown with their service diplomas for 50 and 40 years respectively. These were presented by Bro. 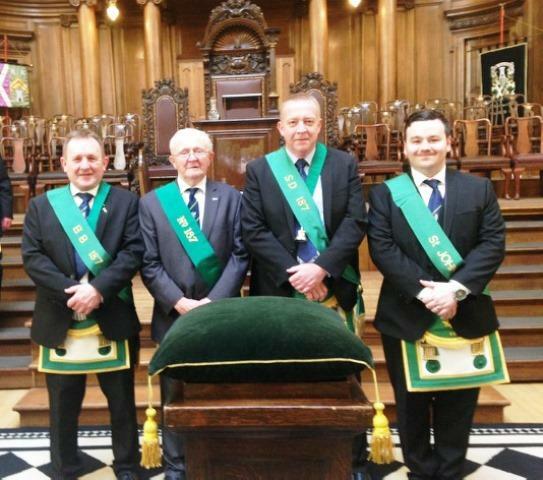 Alexander G. Thomson, Depute Provincial Grand Master and Fraser J.D. 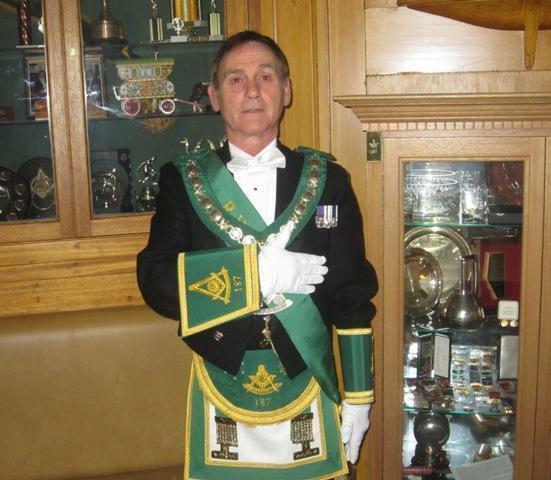 Lyle, Immediate Past Master. 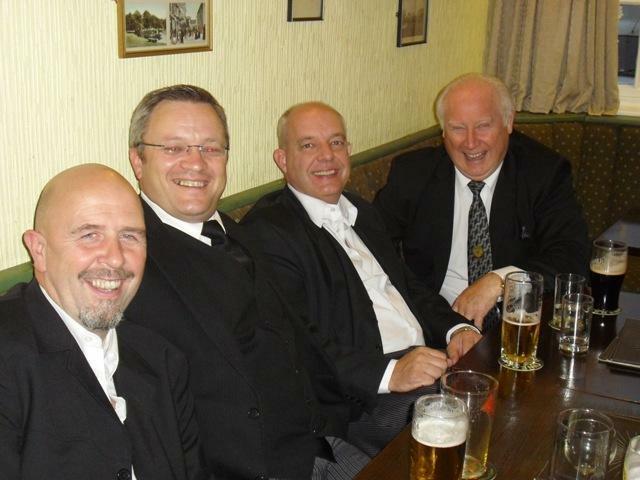 Brethen from 187 with friends from Old Ruthinian No. 9399 (EC).